The timer is installed at ground level at the central source. Thanks to the CPD plumbing department, the central water at Grant Bark Park is now running off a mechanical timer. The timer was installed to address the longstanding ‘issue’ of the water hydrant being left on 24/7 to run the improvised fountain at the center of the park. It works beautifully. 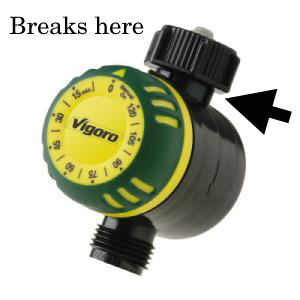 The water flow is controlled by a simple egg-timer mechanism, and it can be set to shut off water flow after 15 minutes to 2 hours. The connections look to be leak-free, so there should never be a need to shut water off at the source. (There are two wrenches for the source stored in the lockbox). Please try to use this timer, and to educate others how to use it: you want your dogs to play in a water fountain, you turn the dial, and you can leave the park without worry or guilt! The flow timer is plastic, and we don’t know how long it will last in the weather, or whether it will break due to heavy or clumsy use. That’s fine – they are cheap ($14.77 at Home Depot), and if over time the mechanical timer works well as a way to regulate the water from the central source, the Dog PAC will budget to replace them periodically as necessary. If you see that it’s broken – contact us! 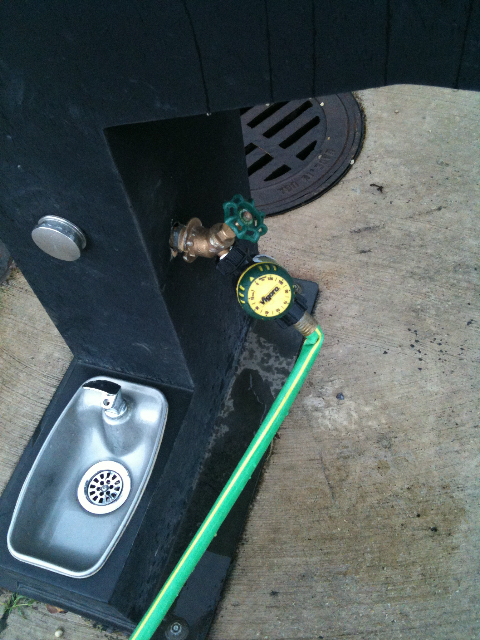 We’ve also installed a timer at the water fountain spigot. The hose is connected to a sprinkler now, but we imagine that long term the hose may just be left unattached for filling up water bowls (and, if we get our act together, for filling up wading pools). ack. broken again. we’re looking for something better, and will update here when installed. The timer has been superglued and reinstalled at the park. It works. I just watched it shut off after 10 minutes. Please call South Loop Dog PAC if it breaks again! Doh! Turns out the housing broke apart at a glued fitting. We’ll try gluing it back together and/or returning it to Home Depot and/or finding a sturdier timer. Apologies to all ‘doofuses’! We have a problem. Somebody has removed the central timer. Will need a wrench to reinstall. Maybe it’s too hard for some doofus to use! Drains above ground? Timers, again?